Broken Bow Records’ Dustin Lynch will bring one hell of a night to fans nationwide this fall with the launch of his first-ever headline tour. The PLATINUM-selling country star will hit the road full throttle bringing his catchy songs and high-energy show to 35+ cities, including major stops in New York City, Boston, Houston and New Orleans. 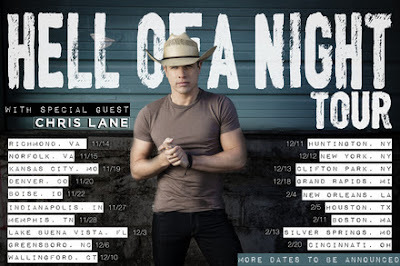 With the first round of dates announced today, the fiery HELL OF A NIGHT TOUR will feature opener Big Loud Records’ rising singer Chris Lane. "Touring with Luke Bryan and Keith Urban, I’ve learned from the best and now to headline my first tour is a dream come true,” shares Lynch. “The first night can’t get here fast enough and I’m excited for fans to see what we have in store!" Tickets for select dates will go on sale to the public on Friday, August 7 starting at 10:00 a.m. local time at www.DustinLynchMusic.com. Fans can further amp up the night with a special VIP Experience powered by CID Entertainment which includes the concert ticket, exclusive pre-show two-song acoustic performance, meet & greet and photo opportunity with Lynch, a limited edition tour poster and more. The premium VIP Experience is now available at bit.ly/1I2FowH. Lynch is currently on the road with Luke Bryan’s 2015 KICK THE DUST UP TOUR and made his first career stadium run this summer. His scorching Top 10-and-climbing hit “Hell Of A Night” is the second single from his latest album WHERE IT’S AT (Broken Bow Records) and follows the multi-week #1, PLATINUM-certified title track that has already notched 16.8 million plus streams on Spotify. Since releasing his PLATINUM debut single, “Cowboys And Angels,” Lynch has launched on to the country music scene. Racking up over 29 million views on YouTube/VEVO, soaring to #1 on the MTV Music Meter and selling 2.6 million digital singles, he brings a fresh combination of traditional influences and edgy intensity to the genre. Producers Mickey Jack Cones, Brett Beavers and Luke Wooten showcase his progressive sound throughout his sophomore album, WHERE IT’S AT, which debuted at #1 on the iTunes Country Albums Chart upon release and has tallied over 1 million tracks sold to date. For on-sale dates and more, visit DustinLynchMusic.com. Lynch’s WHERE IT’S AT is now available on iTunes.